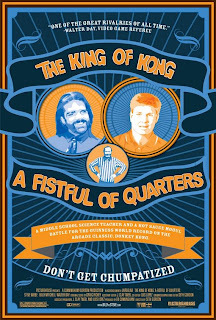 The King of Kong: A Fistful of Quarters may be the best documentary released last year that you didn’t see. While one man’s struggle to dethrone the world champion of Donkey Kong may seem trivial to most, the film treats its subject matter with such respect that even non-gamers will find something to enjoy about this joystick journey. Yep. He just compared a video game competition to abortion. Did you get douche chills? From what I’ve read, director Seth Gordon had a definite bias, choosing a hero in the humble up-and-comer Steve Wiebe and a villain in Mitchell. Whether this rivalry was over-dramatized or not, it makes for compelling filmmaking. If you’re checking out The King of Kong on DVD, be sure to watch the bonus features, which include extended interviews and more footage of Mr. Awesome, a.k.a. Roy Shildt, the Missile Command record holder. His level of insanity is bafflingly entertaining. While The King of Kong might not be worthy of a purchase—particularly if you’re not into classic gaming—it’s a solid, solid rent.